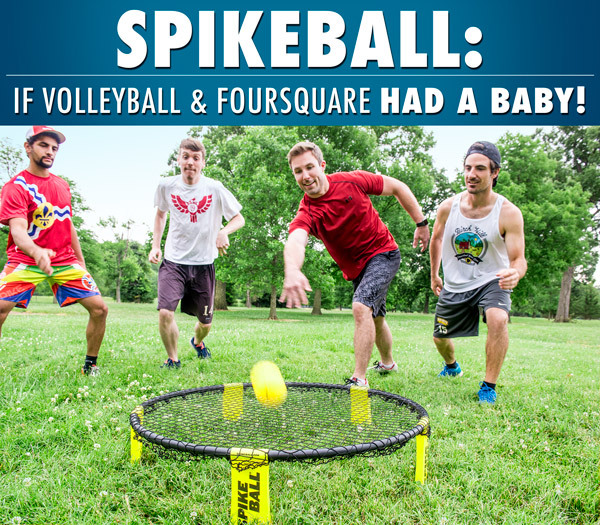 Spikeball: Energetic game combining volleyball and four square. Challenge your friends to a fast-paced and competitive game that will get you blocking, diving, and spiking (and panting). 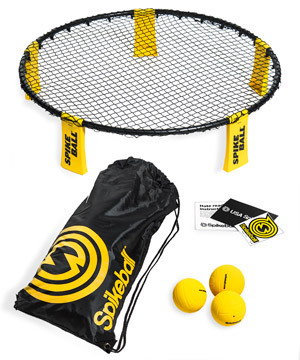 Spikeball is similar to volleyball, but instead of hitting the ball over a net, you hit the ball directly into one. The round net is stretched tightly over a plastic rim, giving the ball a nice bounce when it hits. In this two-on-two game, you use teamwork to volley the ball back into the net in three hits or less. If you’re unable to do so or the ball touches the ground, the other team gets a point. With no sides and no boundaries, you’ll get an all-around workout chasing the ball during your vigorous volleys. Turn up the intensity with a whole new kind of lawn game. 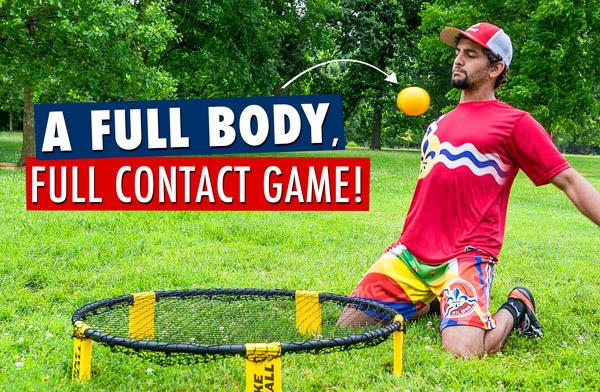 Spikeball is an original sport that combines the teamwork of volleyball, the hand-eye coordination of four square, and the physicality of a cardio workout. The two-on-two game is played with a small rubber ball and an elastic net stretched tight over a plastic rim. The game design encourages strategic sets with plenty of dives and slams. The bounce from the net provides enough airtime for you to make diving saves and have raucous rallies. And since there’s no court, you can play Spikeball nearly anywhere! Skip the punch, spike your next party. 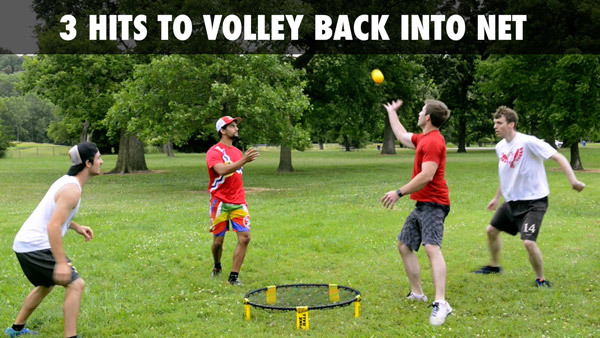 Each point of Spikeball starts with a serve into the net, at which point the other team has three hits to return the ball back into the net, without any player hitting twice in a row. Since no player can hit twice in a row, teamwork is key to win; like in volleyball, you want to set the ball to your teammate so they can aim their shot away from the opposition. There are four ways a point can end: one team is unable to return the ball into the net in three hits, the ball hits the ground, the ball bounces twice on the net, or the ball hits the rim. The game is played with rally scoring, meaning the non-serving team can score a point. Enjoy the fun, fast-paced frenzy! Spikeball moves so fast, you don’t always have time to use your hands to return a shot. Instead, you can use any part of your body to keep the rally going. When you see your opponent lining up a big spike, use your torso to block the ball as soon as it hits the net, and set up your teammate for a winning slam. If you’re feeling especially creative, get your feet and head involved in the game as well! You’re only limited by your creativity… and flexibility. Don’t let your hands have all the fun. 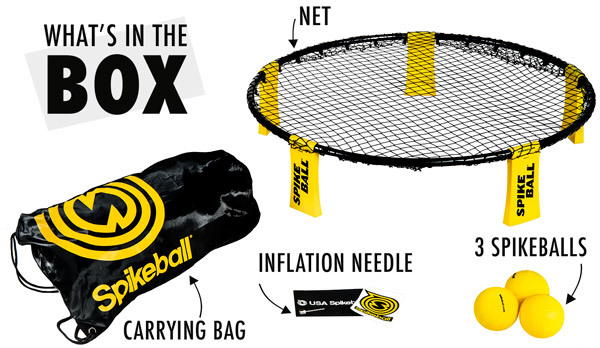 Spikeball is too fun to leave at home, which is why it’s made to be easy to transport and assemble. The curved pieces easily fit into the legs to form the rim. The net then attaches to the clips on the underside of the rim, which allows you to easily adjust the tension to your preference. The pieces all fit into the included carrying sack, so you can take the lightweight game on your next camping trip or beach outing. The Spikeball set also includes three balls, an inflation needle, a rulebook, and Spikeball decals so you can show off your love for your new favorite sport. From the backyard to the beach. Answer: Spikeball points move pretty quickly; most will be over in about ten seconds. Games are usually played to 21 points but you can modify this as you want. Question: Is the net like a trampoline? Answer: The net has no springs, but the elasticity and tension give the ball a trampoline-like bounce. Please note that it would not be able to hold a person’s weight. Question: Can you play this on pavement? Answer: You can play Spikeball anywhere, but it’s definitely designed for sand and grass. Playing on hard surfaces will inhibit your ability to dive and scramble for loose balls.